Sir John, 3rd and last Baronet (1845 - 1900). Sir John Conroy, the 1st Baronet, was born on the 21st October 1786 in Wales but was of mainly Irish ancestry, claiming descent from the O’Maolconaire family of County Roscommon. He was commissioned into the Royal Artillery in 1803, retiring on half pay as a Captain in 1822. In 1808 he married Elizabeth Fisher, a niece of John Fisher, Bishop of Salisbury and sometime tutor to Prince Edward, Duke of Kent. 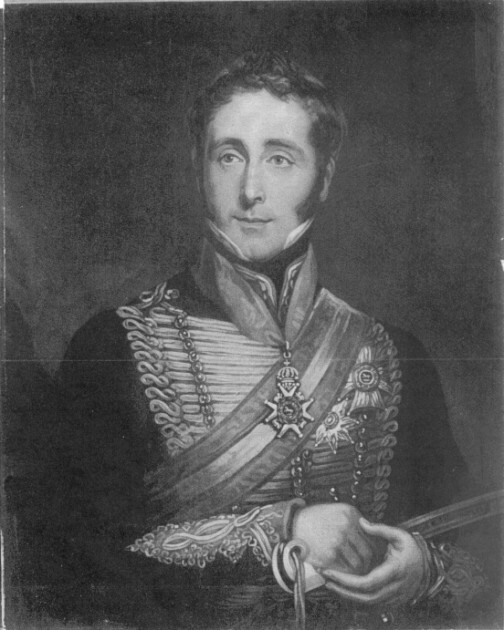 Conroy was appointed Equerry to the Duke in 1818 on the Duke’s marriage in 1818 to Victoire of Saxe-Coburg-Saalfeld, widow of the Prince of Leiningen. The future Queen Victoria was the only child of this marriage. She was born in London in 1819, after a hazardous rush from Germany. This adventure, which was a political gesture as two other Royal Duchesses were preparing to be confined in Hanover, was organised by Conroy. He arranged for the Duke and Duchess of Kent to break their journey at his Shooters Hill house. The Duke died in 1820 but Conroy remained in the service of the Duchess as her principal man of business, and dominated her household throughout Queen Victoria’s childhood. Anyone who watched BBC’s 'Victoria and Albert' couldn’t help noticing Conroy and his influence. All his children were Victoria’s playmates. By the 1830’s Victoria had emerged as Heir Presumptive. Conroy’s organisation and the maintaining of public awareness by orchestrating provincial tours etc. for the Duchess and Princess was beginning to exasperate King William 1V. This was probably instrumental in procuring the Regency Bill, which would have made the Duchess Regent if the King had died before Victoria’s eighteenth birthday. If this had happened, John Conroy would have been the power behind the throne of England for a season. There were rumours that he and the Duchess were lovers, but this was never proved. Aspersions were cast on his financial relations with the Duchess of Kent and Princess Sophia; these had enabled him to acquire substantial estates at Llanbrynmair (Montgomeryshire) and Arborfield. On the accession of Queen Victoria in 1837, Conroy’s fortune went into reverse, because she openly detested him and his continued presence became an irritant to the Queen. He yielded to pressure exerted through the Duke of Wellington and after an extended tour abroad, retired to farm and live the life of a country gentleman at Arborfield. His expected Irish peerage didn’t come to fruition. Instead he received a baronetcy and a pension of £3000 per annum. He received numerous Orders from European Royal Houses and an Honorary DCL from the University of Oxford. As a farmer he was quite an innovator, bringing forward many features of modern agriculture, and building what was known as a 'Model Farm'. He died on 2nd March 1854. Previous to living in Arborfield Hall, he lived in the farm-house, which later became the home of his son Edward. They enlarged it and called it Arborfield Grange. This portrait was painted by William Ward after William Fowler in 1838 or 1839. His son, Sir Edward Conroy, the 2nd Baronet, found that he could not afford to live at the Hall, so it was put up for sale in 1855. He was born on 6th December 1809 in Dublin. After education at Charterhouse, and Christ Church, Oxford (where he graduated with a pass degree) he went on a European Tour. In 1833 he was engaged briefly as an unpaid attaché in the Diplomatic Service in Brussels, and a few years later he obtained a position at the London General Register Office. The last gave him a taste for genealogy and antiquarian studies; to this he gave critical scholarship in matters capable of documentary proof. The story of his private life runs like a Victorian melodrama. In 1837 Lady Alicia Parsons, daughter of the Earl of Rosse, eloped with him from London to Gretna Green, where they were married. However, the romance did not endure. Soon after the birth of their only child in 1845, they parted, probably because Edward Conroy had a roving eye. He had an affair with a 'Mary' in 1847 and a few years later an 'adopted daughter' appears on the scene, although she is believed in fact to be his natural daughter, as she claimed. Shortly before his death, he sent his wife a passionate plea for forgiveness and reconciliation might have followed, but he died too soon on 3rd November 1869. Sir John Conroy, the 3rd and last Baronet, was born at Kensington on 16th August 1845. After Eton, he followed his father to Christ Church, Oxford, where he read Natural Science, taking a First in 1868: Augustus Vernon Harcourt FRS, the pioneer of chemical kinetics, was his tutor. Until 1880 he lived mainly with his mother at Arborfield. He was busy with the social round, hunting, etc., but his early scientific work, involving some analytical chemistry relating chiefly to optical measurements, was undertaken mainly in a laboratory at Christ Church, which he visited for a couple of days a week. He held teaching posts at Keble 1880 - 1890, and at Balliol and Trinity 1886 - 1900. He was elected a Fellow of Balliol in 1890 and FRS in 1891. His friendships outside Oxford and science were mainly derived from aristocratic contacts made during his undergraduate days at Christ Church. He held High Church views taking an active part in the affairs of the English Church Union, and served as Treasurer of the Radcliffe Infirmary at Oxford from 1897. He never married and died in Rome on 15th December 1900. A newspaper article in February 1930 described the monumental inscriptions in the Conroy Chapel, which was beginning to decay, and which has long since lost its roof, its stained glass window and its monuments. It is useful to compare the tone of the article written above with the inscriptions written on the monuments. It is interesting to speculate as to why the Conroy family wished to maintain a separate chapel in the old church - they didn't seem to get on with the Hargreaves family, whom they considered 'Trade'.